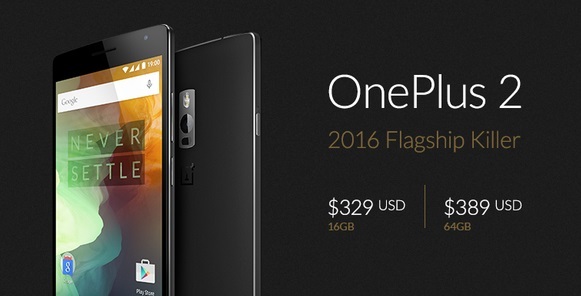 OnePlus finally launched its next flagship phone OnePlus 2. At first there was a lot of questions in mind if the Chinese startup company will be able to deliver the best to the users. As OnePlus always says “Never Settle”, the new OnePlus 2 is quite impressive. The smartphone will range from $329 and the price will vary depending on the the variants. The 16 GB model will be priced at $329 and the 64 GB model will price $389. Check out the specs below. OnePlus 2 is built on a mighty 64-bit architecture and will sport an ultra-premium Qualcomm® Snapdragon™ 810 octa-core processor. This deadly combination is crazy enough to grab eyeballs. The phone will be teamed up with Adreno™ 430 GPU, intensive 3D games and an amazing user interface. 1. 5.5” display sports an impressive 1500:1 contrast ratio. 2. 4GB of LPDDR4 RAM. 3. 16 GB and 64 GB storage. 5. A powerful 3,300 mAh lithium-polymer battery to keep your phone alive through an entire day. 6. 1080p display with a pixel density of 401 PPI. 7. IPS LCD and ultra-bright LED technologies. 8. 178 degrees of crystal clear viewing angles gives the best display experience even in sunlight. 9. The OnePlus 2 camera sensor contains large 1.3µm light-collecting pixels with 13MP smartphone camera, another great combination to boost low light photography. I like the design a lot. It’s far more pleasing than the iPhone 6 Plus is. I don’t like that there’s no microSD card slot however, as that’s a right inconvenience for me.Dual sim! Good! I hope it’s the start of a trend, shame they are Nano slots.